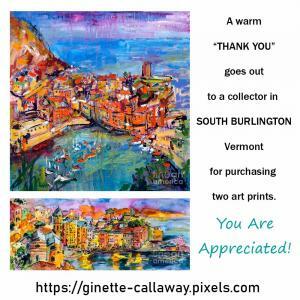 I want to give a warm THANK YOU to a buyer in Burlington Vermont for purchasing two art prints from my #galleries #These are both in the Italy Cinque Terre gallery. One is a watercolor the other an oil painting. Each sell helps me to get closer to my #van #conversion boondocking plain air travel lifestyle THANK YOU #Miami for your purchase. Every print sale is highly appreciated. Someone in Miami bought a large canvas print. This is so great. OMG I am so excited I need the money to make it all happen. It's going to happen. 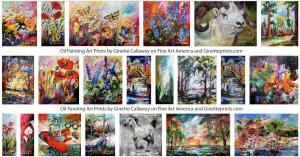 If I have to I live in an empty box van on nuts and water, but I will travel and paint from locations. The plan is to convert a van by building it out with sleeping space, a sink, small cooking space, solar panels, a composting toilet, fresh and gray water tanks (small) it's a van so there are space limits but it will be enough for me. I am so simplifying my life. I'll be on the road part-time at first. Husband is doing the van conversion. I'll post on my blog whne we build it. Pictures and video. THANK YOU AGAIN to anyone who buys a print! All the best radiant energy Love & Light to you! 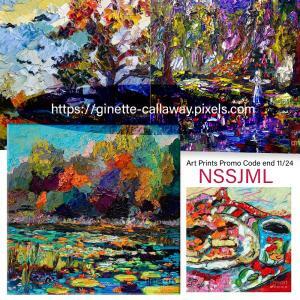 A wonderful opportunity to purchase art prints by Ginette Callaway with a generous discount code. Don't miss this great opportunity to save big. 30% off ends July 3rd at midnight one day before the festivities. 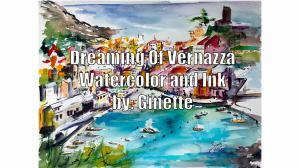 Shop art prints by Ginette now, don't miss it. Happy to announce that my oil on paper sold a couple of days ago. Wonderful collector from Orlando snapped it up during my Spring sale. She also asked me to paint a sister piece that will hang next to it. It will be a 18 inch wide and 24 inch tall oil painting on paper. I am totally excited to begin. I decided to purchase a few extra tubes of Williamsburg paint since that is the type of paint I used to the�first one. I prefer Williamsburg to almost any other paint but it is expense. Well you really get what you pay for. Handmade and the colors are. 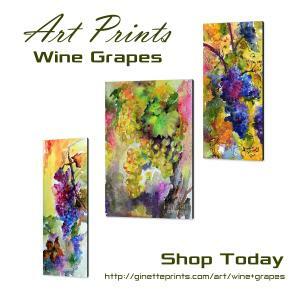 I ordered�them Wednesday and had them shipped overnight express so they just arrived. Here is a picture of the new German Earth, Cadmium red medium, French Terra Verte, and Cobalt Turquoise Greenish. Some of my older, some almost empty tubes of Williamsburg paint. Check out the�Williamsburg website for more information on this excellent paint. They don't pay me or give me any discount for saying that! So today is my promotions day and tomorrow I am going to develop the new painting. 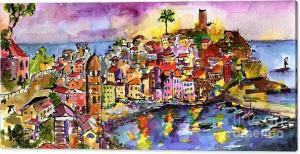 I had a wonderful conversation with my client that gave me a good idea what she likes and she is great in that she gives me all the�creative freedom I need to make the new painting a success. 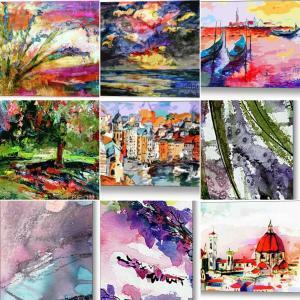 So I'll �go for a painting that will harmonize with the one she bought but be different at the same time. This is the one she bought. Watch me paint this piece!